Only a few days away. 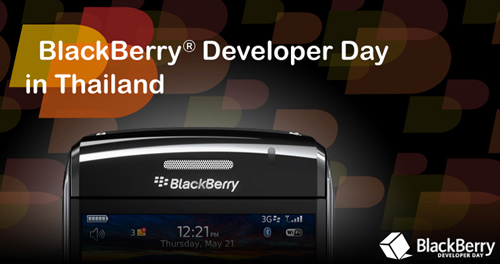 BlackBerry Developer Day that is, which will soon be upon local and international developers in Thailand. It is an opportunity where developers are able to interact and learn more about BlackBerry application development. The event will be held at the Sheraton Grande Sukhumvit hotel on October 20. Registrations have already been closed, but there is much interesting going to happen that we will hopefully be able to cover later. Probably nothing we already do not know about; think of it as a "mini" Developer Conference. With a tight schedule and a couple of coffee breaks, BlackBerry Developer Day consists of 8+ hours of pure developer fun. At the event there will be a local partner - MovieSeer - discussing the experience of developing for the BlackBerry platform. MovieSeer is known for its interesting cultural themes and the Tata Young Music Application, all available on BlackBerry App World. New and experienced developers alike will be able to get started with BlackBerry application development as the basics are covered. From there, it will be the BlackBerry WebWorks Bootcamp followed by a half an hour long presentation of creating visually stunning applications with BlackBerry 6. Developers will also get to know BlackBerry Locate Service and some Super App concepts such as integration of an application with Universal Search. Exciting stuff like debugging and optimization tricks are also in the mix, with a bit of marketing tips later on.